The Principals: Kenneth Branagh (Director), Chris Hemsworth, Tom Hiddleston, Natalie Portman, Anthony Hopkins, Stellan Skarsgård, (the winningly amusing and bewitchingly plush) Kat Dennings, (not nearly enough) Idris Elba, (a nigh-unrecognizable) Colm Feore, (The Punisher, himself) Ray Stevenson, (a woefully underutilized) Rene Russo, Clark Gregg, Jeremy Renner (but just barely) and (as always) Stan Lee. The Premise: The Mighty Thor Odinson, Norse God Of Thunder and wielder of the similarly mighty mythical hammer Mjolnir (“The Crusher”), is a noble and just but arrogant and foolhardy prince of the fantastical realm of Asgard and unprepared heir apparent to his father, Odin Borson’s throne – a fact that doesn’t sit particularly well with his cunning, calculating and decidely insecure younger brother, Loki. Sensing their father’s justifiable apprehension about Thor’s imminent ascension and exploiting his trophy-son brother’s overwhelming machismo, Loki subtly orchestrates various clever machinations that result in Thor, Lady Sif & The Warriors Three’s impulsive and ill-advised invasion of Jotunheim, the neighboring domain of the dreaded Frost Giants, his brother’s subsequent demotion to mere mortal (but still really, really ridiculously good-looking) man and indefinite exile to Midgard (what you Muggles call, “Earth”) at the hands of their thoroughly disappointed and disapproving father (but really, is there any other kind? ), Odin’s premature slip into his Odinsleep-induced coma (which ironically leaves the big man in a vulnerable mortal state himself, as well), the vacating of the throne and his own power-hungry assumption of it – all in head-spinningly rapid succession. "I would have vastly preferred a hammer..."
Completely stranded and alone in the New Mexican desert, Thor finds himself stripped of his beloved warhammer and his Mighty-ness and forced to somehow find a way to redeem himself and learn the definition and value of a true hero before he can ever hope to have a shot at making his way back to Asgard and reclaiming his birthright. He is soon conveniently discovered desperately wandering the wilds by a motley crew of scientists – 2/3rds of whom are perhaps a bit too young and easily enamored to be fully believable as brilliant trailblazing astrophysicists but are undeniably volcanically hot and thereby prevent the viewer from considering such things until much later. This odd little team happens to be conducting experimental research into magical desert lightstorms that might just be interdimensional wormholes and just might be able to help our lost but intrepid hero on his hero’s journey home. After running him over with their mobile lab SUV a couple times and offering him Pop-Tarts and beer, they all become friends and then begin to realize that this handsome young devil spinning tales of mystical science and the “Nine Realms Of Yggdrasil” might not be the raving lunatic vagrant they initially presumed and actually need to be reunited with his hammer-in-the-stone so as to perhaps eventually save the world. Or at the very least, brutally resolve that bitter, high-stakes sibling rivalry he’s so deeply embroiled in. Is It Good? : While Thor is certainly quite considerably decent, it is unfortunately far from truly great; energetic and well-made escapist entertainment but not really much more than fairly lightweight and middle-of-the-road superhero fare. Although, to be fair, the film didn’t really ultimately set its sights all that high to begin with and does seem geared more directly toward a younger audience than previous Marvel installments. Thor is ultimately a highly capable cog in the increasingly mighty Marvel movie machine that is merely good instead of the something truly special it could have been at some point. Don’t smite me just yet! Please allow me to attempt to explain my own reservations about the flick first! The following will most likely not be very widely respected feelings and will also probably come off a lot more negative than I’d prefer or actually intend so let me just preface right now by saying that I do REALLY LIKE Thor….but I just can’t muster a whole ton of true LOVE for it and that does deeply disappoint me. Viewing the Marvel Movieverse as a whole, Thor comes in right below The Incredible Hulk and only just above Iron Man 2 in my book – although, admittedly, I do personally find the latter a bit more entertaining and rewatchable but that’s almost unfair seeing as Thor isn’t blessed with a potent secret weapon like IM2‘s Sam Rockwell’s rendition of the hilariously inept and endearingly facetious Stark-wannabe Justin Hammer. Nevertheless, I’d definitely say Thor‘s a more solidly satisfying movie overall than Iron Man’s busy and rambling second outing and that is especially true on a narrative level. "I get 'beefcake' a lot back home, too." There’s definitely a lot to totally dig on, not the least of which are a true star turn by Hemsworth as the Thunder God and a surprisingly sympathetic, invested and nuanced performance by Hiddleston as the God Of Lies & Mischief but there is no denying that some fairly deep-set flaws do abound – they’re just really easy to willfully ignore because the movie is so generally fun, fast-paced and charmingly affable. For one, this entry in Marvel’s epic cinematic saga is the most severely kneecapped by the studio’s infamous frugality – understandable to a certain extent given the fact that, of all the assembled Avengers they presently hold the rights to, Thor would definitely appear to potentially be the toughest sell to a broad audience and the most difficult to manage in tone and style. Thor, the Kingdom Of Asgard and its assorted denizens are fictional fixtures firmly planted in the previously uncharted filmic territory of cosmic Marvel and the least rooted in the more-or-less real world aesthetic heretofore established by Iron Man and The Incredible Hulk and thus inherently risky and wonky. Sure, comic book movies seem automatically geared to a wide four-quadrant audience but the potential to fall hopelessly into camp, off-puttingly overt geekery and/or outright silliness and thereby alienate the mainstream global moviegoing public with this specific property was huge. This thought process is most assuredly what led to Mark Protosevich’s original massive-scale screenplay being dramatically reworked, stripped-down and overly-simplified for easy summer tentpole digestion. Hiring British thespian Kenneth Branagh to helm the project was a pretty damn savvy move on Marvel’s part but ultimately proved to be something of a double-edged sword. While he does thankfully invest the flick with some extremely welcome dramatic heft, emotional complexity, thematic resonance and Shakespearean gravitas, Branagh’s unfamiliarized handling of the pulpy superpowered action sequences and somewhat ineffective implementation of the less-than-stellar VFX work leaves something to be desired. 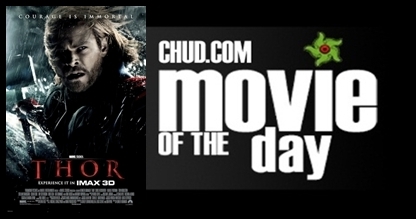 Just take a look at the raid on Jotunheim, for example: sure, it’s enthusiastic and bombastic enough but it’s also murky, overly familiar and plainly-staged. And that stampeding horned beast beat feels like the reheated leftovers of similarly forgettable scenes in any number of recent sci-fi action flicks with some crowd-pleasing hammertime thrown in. The plethora of cockeyed dutch angles plaguing the film from beginning to end doesn’t help matters, either. You can feel Marvel Studios’ cost-cutting at work whenever the film cuts away from the big, bold Asgardian intrigue and colorful supporting cast in favor of the anonymous New Mexico setting with the Earthbound characters just sort of messing about or talking shop and science. Seeing as the title character is the one stuck on Earth, that is sadly quite often. It’s a little frustrating to be constantly teased with blockbuster scope and scale only to be quickly relegated back to what could be more or less fairly mistaken for the handsomely-mounted pilot episode of a weekly Thor TV series. Like IM2, Thor is a Marvel movie negatively impacted by studio-mandated S.H.I.E.L.D. involvement and all the strenuous pre-AVENGERS set-up and tie-ins that those tedious plot contrivances have come to represent. All the S.H.I.E.L.D. stuff with Agent Coulson strong-arming Jane Foster and her team out of their research efforts and pointlessly cordoning off Mjolnir just so Thor can brawl with some random security guards for awhile all and viewers can be clumsily introduced to Hawkeye in a very tacked-on-at-the-last-possible-minute cameo appearance robs precious screen time from the core plot and relationship dynamics. The S.H.I.E.L.D. scenes are essentially a lazy second-act padding cheat and only lead to a stream of wasted opportunities to effectively illustrate a genuine burgeoning romantic interest between Thor and Jane and, more importantly, lend weight to Thor’s self-actualizing hero quest and the crux of the film’s simple origin story. Instead of any of that, we get a ton of empty conflicts with government agents and aimless wheel-spinning. When the film needs to enter its climactic moments, all of a sudden Thor and Jane Foster are have fallen in love and everyone just kind of mutually agrees that Thor has simply spent enough time as a puny human and is indeed a real-deal hero deserving of ultimate power, ready and willing to make significant sacrifices to save worlds at the drop of a hat. A stream of convenient development that is in no way earned is what we get simply because we have to for the story to approach a resolution and hey, we all know the big lug is a great guy and destined to save the day, anyway, right? And that Rainbow Bridge finale? Come on! The superhuman brother vs. superhuman brother smackdown is sturdy and all but the film completely fails to connect the dots by whiffing a golden opportunity to deliver a moment of honestly poignant evolution for its titular hero. 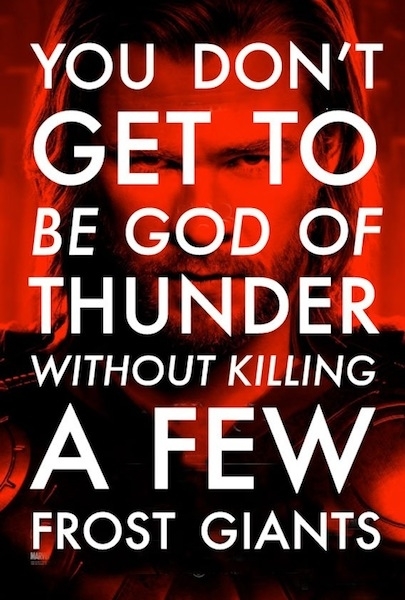 The film could have practically made one great last stab at storytelling significance by having Thor stranded back on Earth after having given up his otherworldly home in order to destroy the portal and selflessly save an entire race of people he would have so callously destroyed at the outset of the story. I mean, he’s a real hero now, right? Simply breaking off his magical link to some P.Y.T. he spent a couple of days with on some primitive world can’t really be the biggest deal to a guy who’s already a couple millennia old and likely surrounded by brilliant and beautiful demigoddesses he already knows who’d all likely line up for lightyears for a chance at romancing the god who would be king. I would have thought that Lady Sif would have had a lot going for her – not to mention the bedrock of a long, preexisting relationship with the guy. And doesn’t he gotta somehow get back to Midgard to save the world in MARVEL’S THE AVENGERS, anyway? Why not end the film with him trapped on Earth again with his new lady love, Jane Foster so he’s ready to rumble when that special assembly is required? And Jane can still keep up her good pseudo-scientific work so as to one day open up a new path to Asgard for her big blond badass! Maybe then they could actually spend quality time together and legitimately fall in love instead of engaging in a constant stream of googly-eyes and a quickie make-out sesh before an anti-climactic battle and then calling it a case of star-crossed lovers? That would have been way more effective than simply winding everything back to square one once more (minus a deranged and power-mad younger sibling, of course). "Mjolnir is NOT a phallic object, DAMN YOU!" I know that my mixed-to-positive opinion on Thor may not necessarily be a particularly popular one but I’d encourage you to revisit Thor with a level head and clear eye and at least partially reconsider certain key aspects of the production before writing off my gripes with the film entirely. But come on now, I know you’ve seen it and having done so, you’re (hopefully) already well-aware that Thor is undeniably worth your time and devoting some sizable chunk of your affections. I know my lengthy diatribe above focused far too much on the flick’s faults but that’s only because virtually everyone I’ve talked to about it only ever sings its high praises and I figure it’s always good to expose oneself to an alternative viewpoint for a more balanced and enriching appreciation of something. Please allow me to reiterate that there’s plenty to dig about Thor: Chris Hemsworth effortlessly embodying the iconic role of the Thunder God, Tom Hiddleston brilliantly crafting Loki into a worthy and engrossing adversary, the fantastic ensemble cast of interesting characters, twisted and compelling familial drama, lavish and eye-catching costume and set design that’s ripped straight from co-creator Jack Kirby’s own wildest panels, Kenneth Branagh’s deft dramatic touch, eager-to-please action, some tantalizing build-up to Marvel’s The Avengers, the merry misadventuring antics of Lady Sif & The Warriors Three, Idris Elba’s commanding presence as the genuinely badass Heimdall, the visual realization of the Rainbow Bridge, the talented and lovely Kat Dennings being her magnetic and laconically funny self, “This drink…I like it! ANOTHER.”, the fact that a Thor movie even exists at all! The list does go on; the only thing is that there is just not ever quite enough of many of those engaging elements consistently present to warrant a strong, lasting and rabid love for the film in my own humble estimation. And it’s always great to see Rene Russo but she is so criminally wasted in her incredibly limited screentime and sparse dialogue here, it’s unforgivable. Random Anecdotes: Matthew Vaughn, another terrific British filmmaker, was attached to direct this film back in the mid-aughts (around the same time, he was also torturously attempting to develop the 3rd X-Men movie over at Fox) from the initial epic script written by tragically oft-rewritten scribe, Mark Protosevich. As I’m sure you know, Vaughn eventually went on to accomplish the amazing and supremely unlikely feat of making X-Men: First Class genuinely great against all odds and despite the relentless micromanagement of and comically abbreviated production schedule mandated by the tyrannical regime over at Fox; a very gracious and surprising move considering just how terribly they had treated the poor guy while he so futilely tried to get the 3rd entry off the ground just a few short years before. Many, many names were batted about in serious contention for the title role before Chris Hemsworth proved himself worthy of wielding Thor’s hammer: Brad Pitt was a loftily ambitious goal, Daniel Craig was a top choice, WWE Superstar HHH was an obvious potential contender, future rebooted RoboCop Joel Kinnaman screen-tested, Channing Tatum was considered, Son Of Anarchy Charlie Hunnam gave it a shot, Tom Hiddleston originally auditioned for it but Branagh envisioned him as Loki, “Stellanson” Alexander Skarsgård even threw his name in the hat and funnily enough, Chris’s own little brother Liam entered the casting equation close to the end of the selection process, as well. Despite being thoroughly awesome and possessing a remarkable real-life comic book figure, the inexplicably underexposed and superhumanly alluring Diora Baird was passed over for the role of Lady Sif, Goddess Of War for some surely nonsensical reason. No offense to Jaimie Alexander or anything but I love Diora Baird and therefore that is an outrage! Cinematic Soulmates: Naturally, the entire cinematographic canon of Marvel Studios – including The Avengers, William Shakespeare’s Hamlet, King Lear, Brothers, Slumdog Millionaire, Starman, K-Pax, Superman, The Sword In The Stone, Gladiator, John Carter…Of Mars, Clash Of The Titans, Masters Of The Universe, Highlander, The Lord Of The Rings: The Return Of The King.